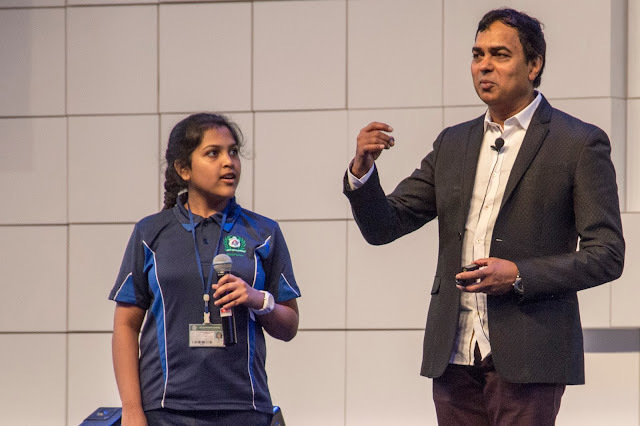 Students from schools and universities across UAE were inspired with innovation secrets of Google by its chief evangelist of brand marketing, Gopi Kallayil, at the 35th Sharjah International Book Fair held on Nov. 6. So, how does Google, one of the leading brands in the world known for their innovations, innovate? The secrets shared by Kallayil were awe-inspiring to the thousands of students in attendance. Gopi Kallayil (right) with a student from Delhi Private School Sharjah (left) at the 35th Sharjah International Book Fair. “There is no innovation department at Google. Everybody, the whole company, is responsible for innovation… no matter what your job is… you could be a chef at the Google café and you’re expected to be innovative,” said Kallayil. ’And that’s what the first secret is: innovation can come from anywhere. The remaining secrets include focusing on the user, thinking ten times on an idea, betting on technical insights, spending 20 percent time on an idea, keeping the tech open source, failing well, and having a mission that matters. Kalayill said that every innovation at Google has three basic requisites: a really good problem, a radical solution, and a breakthrough technology. He went on to explain these requisites with examples on Project Loon, Google Home, and driverless cars. “Every organization has a unique way of looking at the world, because of the kind of data we have, and the kind of experience we have,” said Kallayil. Sharjah International Book Fair continues until Nov. 12 at Sharjah Expo Center – bringing acclaimed authors and their fans together for more interesting sessions and discussions, for love of the written word.